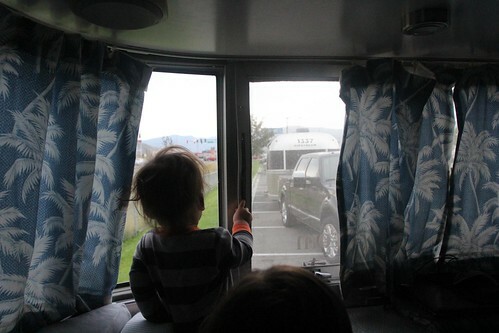 Mali Mish – Days 25-26: The Traveling Airstream Neighborhood at Aluminogan 2013. Being our only boy, Luka is a lot different than the girls. For one thing, he is really into dudes. He will pretty much latch on to any dude before he will a woman. I don’t know what this means long term but right now, he can not get enough of Josh. 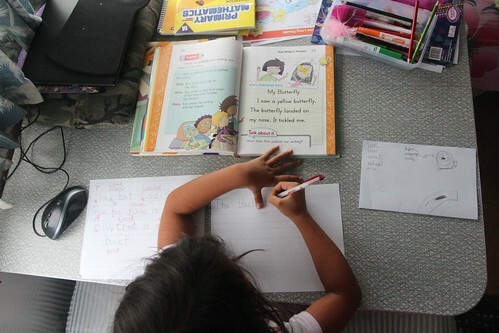 Before we head towards Brian and Leigh’s property in Tonasket, we are staying here a bit to work on a little homeschooling. 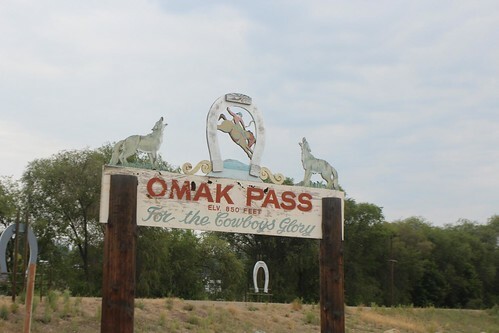 The drive from Omak is relatively short 50 mile drive. We have never been to their property and about half of it is 2-lane county roads that might be hard to navigate, so we will take things slow. From here, we are also less than 50 miles from the Canadian border. 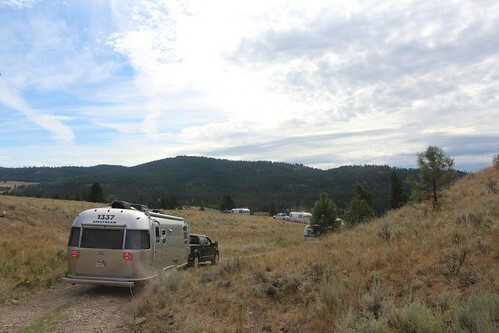 It isn’t one of the most popular border crossings so we will see how it goes with 8 airstreams in a few days. Summer in this part of Washington is pretty fantastic. 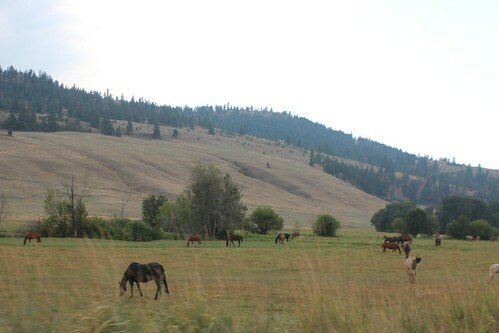 We are far inland enough to get a mixture of both mountains and desert landscapes. We made our way to one of the landmarks we were suppose to lookout for on our way in. A donkey tied to a post. Wait, maybe it was an old man smoking a pipe… Ahh, right, a long line of mailboxes. That’s it. 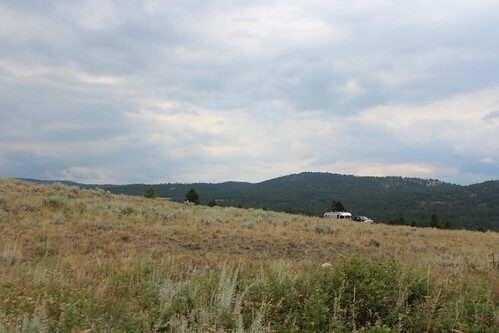 As we began to make our approach to the property, we can tell that there were already two airstreams there. Brian and Leigh of Aluminarium who own the property and Tim and Amanda of Watson Wander who came here about a week early to hang out. It will not be long until more join us. 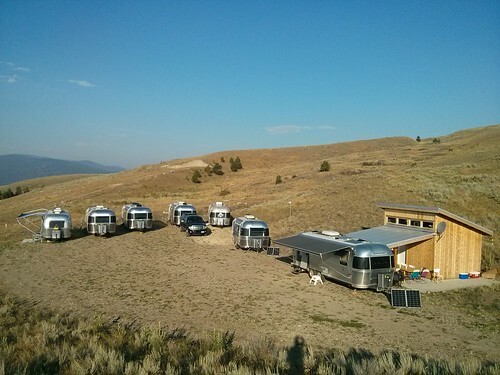 By the end of the day, we added 3 more to our caravan. Some of these people we have met in the past yet many we are meeting for the first time. Kevin and Laura of Riveted Blog, John and Laura of The Democratic Travelers and David and Ann of Adventures of David and Ann. Soon we will have a total of 8 once Deke and Tiffani of Weaselmouth finally make their way here. 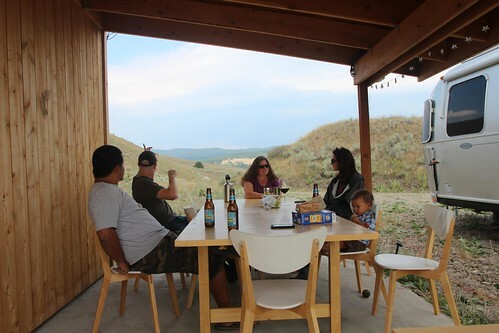 Brian and Leigh’s property sits on a hill side with views over a large plot of rolling hills to the south. The property continues to rise to the north and a few of us decided to take a hike around their 20 acres of land to check it out. 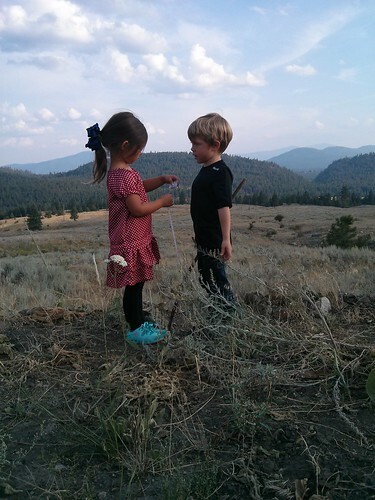 Josh and Jessa volunteered to take our girls with them so we stayed back to hang out with the rest of the crew. 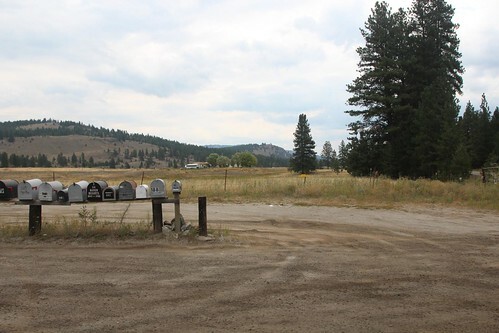 Since they bought the land, a handful of improvements have been done to make this place more usable. 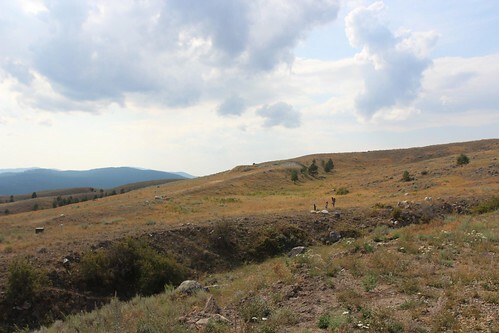 As most of it sits on a gentle hill side, a portion had to be graded flat so it can be used. A large shed was also constructed that serves as storage with a nice shaded porch area with a concrete slab that we use as a gathering place. The name Aluminogan is a portmanteau from the words Aluminum and Okanogan. 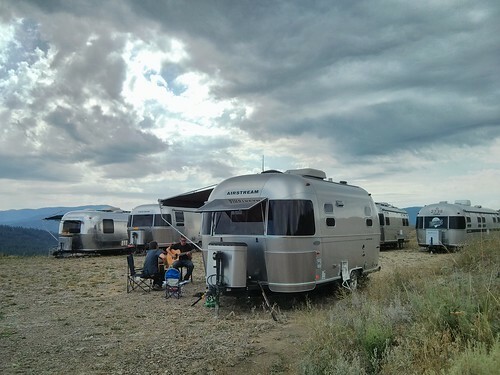 The first word clearly refers to the airstreams in attendance and Okanogan is the name of the region and also happens to have been derived from a native word meeting ‘Meeting Place’. Pretty clever, isn’t it? This is technically the second annual event with last year’s Aluminogan attended only by Deke and Tiffani of Weaselmouth. We are glad to be included in this year’s gathering and hope we will be attending more in the future. We were here for 2 nights which seemed to fly by. By the time we left Aluminogan, we all felt like we’ve known each other for years. Of course the fact that all of us keep a pretty steady online presence also means that we knew lots about each other before we ever met. 1. Brian and Leigh blog at Aluminarium. They have been full timing for many years and started with a vintage Flying Cloud before moving on to a new Flying Cloud 27FB. They are married and travel with their pup Curtis. 2. 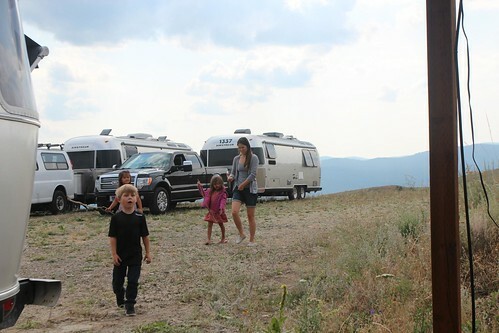 Tim and Amanda Watson have been on the road for about 2 years and share their life on the road at Watson Wander. They came from Vermont and are in a 90’s 25 ft Safari that they have customized to their lifestyle. 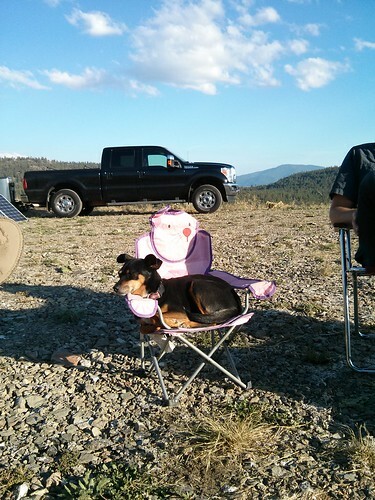 Like Brian and Leigh, they enjoy spending a lot of time boondocking in remote areas far away from RV parks with their pup Phineas. 3. 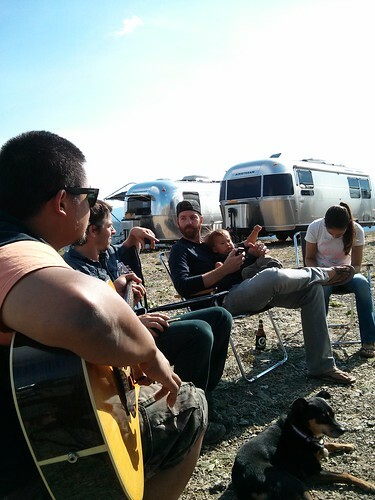 Josh, Jessa and Jack Works sold everything 3 years ago to travel in their Airstream International 27FB CCD. 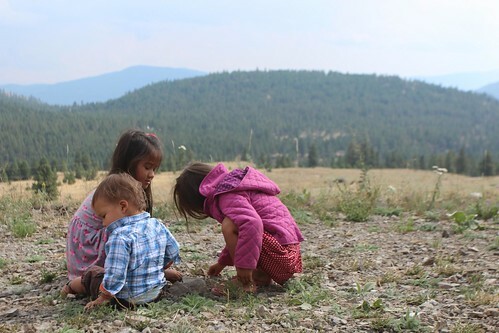 Originally from Kansas, they spend much of their time traveling the country to see as many national parks as they can. They can be found at 1337stream or more frequently at their respective Instagram accounts. 4. Kevin and Laura from Riveted Blog are from Portland. 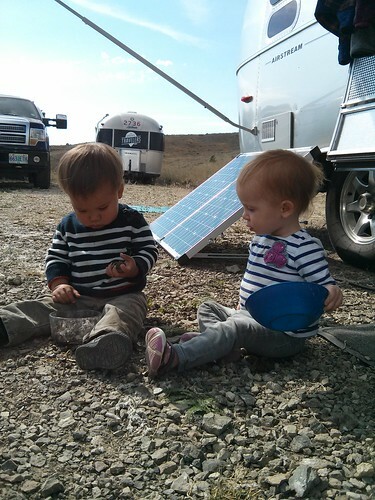 They spend a few months a year traveling the country while running their own businesses. Laura is a photographer while Kevin operates a popular online electronics engineering journal. 5. Deke and Tiffani can be found at Weaselmouth. 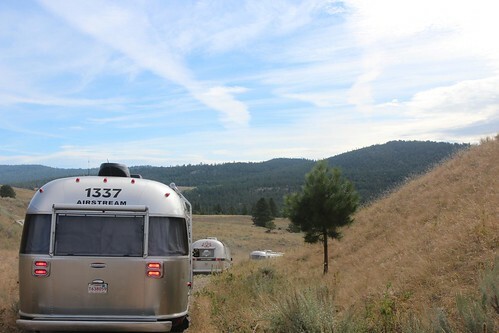 They have been long time Airstream owners and live full time in their 27FB in the Seattle area. Deke is in the computer gaming industry and can found most nights glued to his xbox. 6. 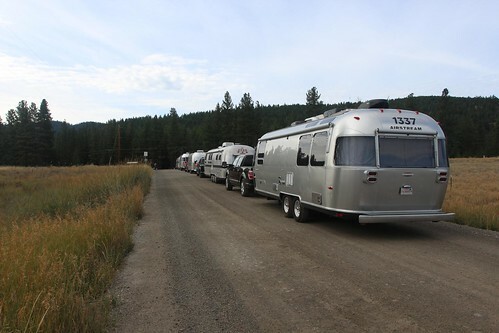 David and Ann are veteran travelers relatively new to the Airstream world. 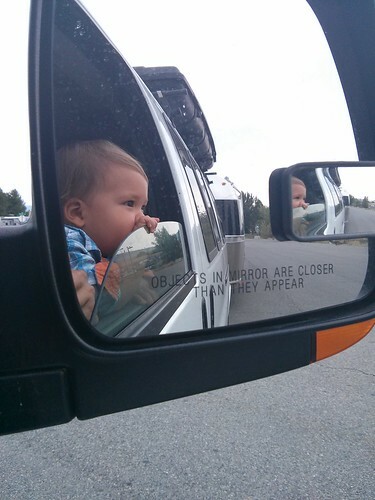 They have taken their Nissan Xterra from San Francisco to Panama in an overlanding adventure. 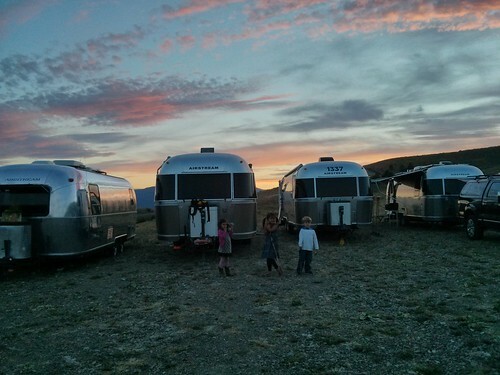 Having been successful in the initial dot com era of the late 1990’s, David and Ann can now be found traveling in their Airstream or running a small farmlet in San Francisco’s north bay with their daughter Wynne and their pup Gorilla. 7. John and Laura of The Democratic Travelers are a couple of 20-something college grads from New York with a wild idea. 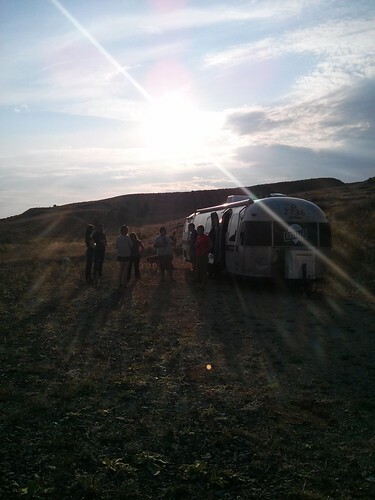 They decided to buy a truck, build a website and ask the world where they should go in a 34-ft Airstream. Luckily there were enough of us who voted them to come on this trip with us to Canada. 8. Well, the 8th Airsteam is yours truly. If you need to learn more about us, you have come to the right place. As of February 2014, we have over 600 posts about our travels all around this great country of ours. Aluminogan really allowed us to get to know the people we already do a lot better and also a chance to be acquainted with new friends. It was like a great big traveling neighborhood that all got together and it felt like we’ve always lived here. 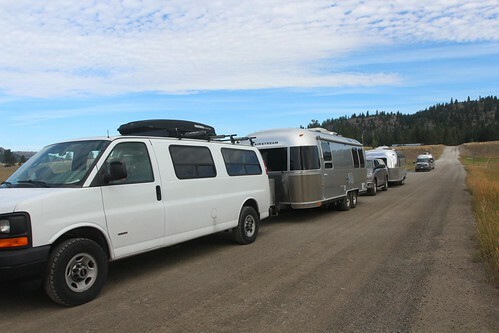 After two nights here we will all hitch up and begin making our way towards the Canadian border. We spent the last dinner at Aluminogan having a Mexican themed potluck. We were all tasked to bring a dish to the meal and my contribution was a tray of perfectly pan-friend bacon. As far as I am concerned, it goes with everything. The next morning our convoy began making its way down the hill. We’ve caravanned with other Airstreamers in the past but never more than just a couple. Having 8 of us all in a row was a cool sight. It didn’t take long before our caravan split up into small groups but we did all get a chance to snap a few pics of all of us together on the same road. Starting with the next post we will finally be in Canada. It will be the first time we have ever taken the Mish, Luka and Yoda out of the country.